FISCAL ANALYZER combines financial statement spreading and analysis into a single application for business assessment and credit decisioning. Get working right away in a spreadsheet format that is familiar and easy to work with at every stage of the process, from data entry to analysis and review. FISCAL ANALYZER’s powerful tools calculate ratios, trends, cash flow reports, multi-year analyses, and projections. Industry benchmarks are also included for peer comparisons. Data entry templates correspond to standard tax forms and financial statements. Save time by automating manual tasks and standardizing procedures while increasing the quality and depth of your analysis. Straight-forward data entry using templates based on tax forms and financial statements standardizes spreading. If you need custom rows or calculations, FISCAL ANALYZER makes it easy to create, use, and save custom data entry templates. Spread the personal financial information of owners and guarantors. Then combine the available cash flow of stakeholders with available cash flow from business entities to generate the Global Cash Flow Report. Any time we are more efficient, it allows more time for pursuing our mission. Standard ratio calculations are the basis of any financial analysis. FISCAL ANALYZER provides ratio analysis and calculations that permit in-depth examination into the condition of a business. With a few clicks, quickly examine financial health and make informed credit decisions. Using FISCAL ANALYZER, lenders can easily identify potential lending risk in complex credit relationships between businesses, owners, guarantors, and related parties. Global Cash Flow analysis produces a realistic assessment of a borrower’s and guarantor’s ability to generate sufficient Debt Service Coverage. Since FISCAL ANALYZER stores all of the financial information, you can conduct ongoing analysis for audits, annual reviews, or at any time during the life of the loan. Project future trends and produce analyses that forecast cash flow from your borrower’s financial statements. Multi-period projections and incorporating a loan into the projections provide for even more realistic analysis. The assumptions used to create projections are completely modifiable using a global or line-by-line strategy, giving the analyst a range of outcomes for the appropriate “what-if” scenarios. FISCAL ANALYZER includes Industry Benchmark data, updated annually, for use in peer comparisons. These reliable benchmarks come from two industry-trusted sources: The RMA Annual Statement Studies™ (an optional feature) and IRS Statistics of Income (IRS Pub 1053). Additional custom benchmarks can be created for special use. Generate the Credit Memo with built-in data and analysis from FISCAL ANALYZER. This document is produced in Word format, making it both customizable and editable. The comprehensive Credit Memo accommodates many different loan types, and its output allows us to demonstrate consistency in our processes. Financial analysis is of little value without clear, consistent, and comprehensive reports. FISCAL ANALYZER brings this clarity, consistency, and standardization to the process, producing both detailed and summary reports. Create standard report sets that include the specific reports based on the financial statements, businesses, people, and loans of interest. Detail and summary reports provide the appropriate depth of information for the intended audience. Export and combine analysis reports with credit reports, assessor reports, collateral information, and other documents for more in-depth reporting. 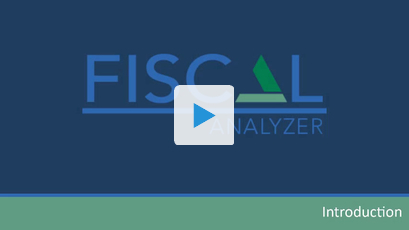 If your institution’s mission is to provide resources and services to maximize economic prosperity, manage growth, and address the ever-changing needs of the constituent communities, FISCAL ANALYZER is right for you. FISCAL ANALYZER’s easy-to-use data entry templates and concise financial reports allow you to quickly put together a strategic financial management plan for your client. Generate break-even analysis, EBITDA and cash-flow analysis, and calculate the key strategic ratios. If you are responsible for approving and extending credit, you need FISCAL ANALYZER. Financial statement analysis includes bankruptcy prediction, seasonal trends and projections with variable assumptions, cash flow, and ratios, all with benchmark comparisons. The unbeatable combination of affordability, ease of use, and features makes FISCAL a vital part of our process. On the very first statement I spread, FISCAL ANALYZER turned a five-day project into less than a day’s work.